Capturing gifts immediately on credit cards is the best way to improve phonathon pledge fulfillment and dollar fulfillment rates. The higher the percentage of pledges completed on the phone, the more pledges and dollars your institution has in the door right now. Credit card success starts at recruitment. Present your candidates with the fact the job requires them to process credit cards, because by doing so, it sets the precedent for the job’s priorities. Below is a recent flyer I used, which mentions credit card processing as part of the job. As you may notice, there is no indication of pledge cards in the advertisement. By doing so, we set the precedent for our preferred fulfillment practice – credit cards. In the past, I’ve blogged about 1:1 interviews and group interviews. Regardless of how you hold interviews, when reviewing the job description with your candidates, be sure to address credit cards. Explain how they are utilized and why they are the preferred method of gift processing. 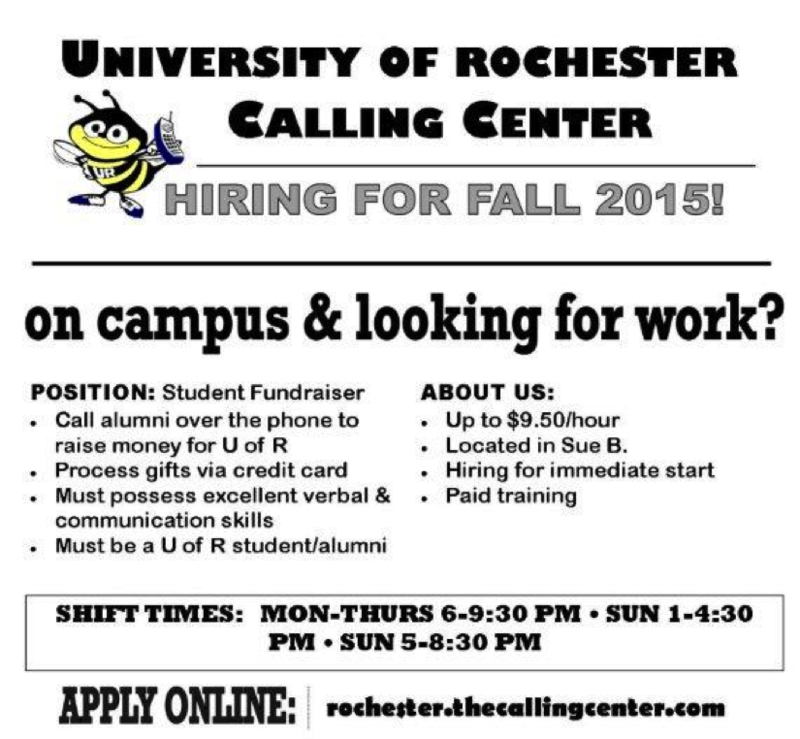 If you have callers read through a sample phonathon script during the interview, have it include credit card asks. Avoid discussing the option of sending donors pledge cards at this stage. After you’ve selected your candidates for hire, train them to be credit card champions! Spend considerable time reviewing the importance of gift fulfillment and best practices. Set the bar high in terms of their credit card percentages. Only after you review the process of accepting credit cards extensively should you introduce the notion of pledge cards. Continue to emphasize credit card performance with your returning callers. Discuss best practices as a group, and have your top credit callers lead a training session. Pair up stronger credit card callers with those who can make improvement, and regularly share credit card statistics with your callers so that they know where they stand. In our largest survey of student callers, 69 percent of callers said that asking for credit cards was easy. More than half said it was one of the more enjoyable parts of the job. Don’t be shy about staying on this training topic with your callers. 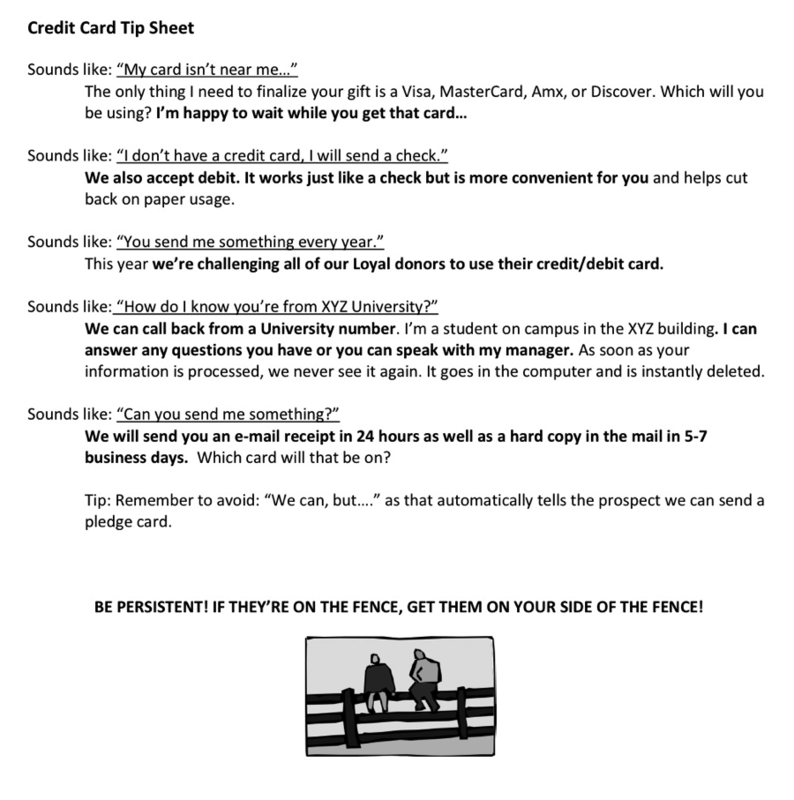 Ensure that your script sets you up for credit card success and increases your phonathon pledge fulfillment rates. After a donor agrees to make a pledge, train your staff to verify matching gift information prior to processing the gift. Not only does this ensure that the gift meets any minimum requirement that a matching company might have, but it also gives your caller legitimacy. In an era of credit card fraud, being overtly eager to obtain someone’s credit card information can be off-putting for donors. Discussing matching gifts before credit cards reinforces the fact that you are calling on behalf of a nonprofit organization. Following the matching gift ask, callers should craft a simple, assumptive credit card ask. “Which card would you like to use?” is golden, whereas “Would you like to put that on a credit card?” gives your donor a chance to easily opt out from choosing your preferred method. Play daily and long-term credit card games that encourage excellent performance. My staff is responsive to the following game: for every credit card they process, they get a “dollar” in-hand. For every pledge card they process, they get the promise to get a dollar in a month’s time, provided that they send me an email to remind me to bring in the money. This game reinforces the value of credit cards! 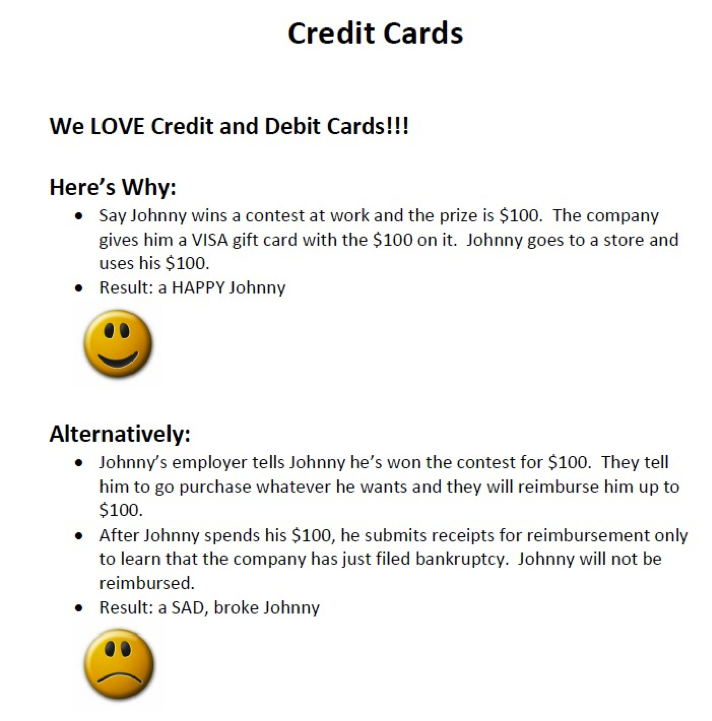 We also implement a credit card bonus where callers gain earn extra funds for meeting their credit card goals. This strategy works. Over the past five years, Ruffalo Noel Levitz phonathons have increased credit card giving rates every year on average, and we also see higher credit card rates for young alumni—an important group for us to get a definite gift from, immediately. By emphasizing credit cards all the way back to recruitment, training hard on this important metric, and actively coaching and rewarding success, you can make this a record-breaking year for credit cards in your phonathon and increase your phonathon pledge fulfillment rates. Do you want to see more gifts—immediately—from your phonathon program? Contact us to find out how our expert consultants and managers can help make it happen.